The alarm goes off to start the day. It is 6am and not my favourite time to be up. There was no need for an alarm, as by now and as exhausted as I was, which was most of the time, I would lift myself automatically, with or without a wake up call. Stirring from sleep was never fast, and “jumping” out of bed was more a gradual and cumbersome thing, as my limbs would try to come back to motion. It wasn’t uncommon to find myself with my gi (uniform) on, having gone to bed too late and too tired to bother changing. Sometimes so tired I would wake up in the exact position I went to sleep in, exhausted to the point of not moving even in my sleep. I would then head down stairs and into the mens dressing room, then past the Japanese style door curtains, called Noren. These are similar to the ones in traditional houses and restaurants in Japan and usually an indigo blue colour with a white design in the middle. I was now into the main training area. No matter how tired I was, no matter how lacking in sleep (sometimes only 3 or 4 hours), entering the dojo area had a special feel to it. It was Inspired by Chiba Sensei, an ambition of his and the product of a labour of love by its members. The space, expansive and big for a dojo, a departure from the smaller earlier dojo’s he managed soon after his arrival to the US. This one was quite a statement, a temple to Aikido et al. The training area alone was 2000 square feet of a green lawn like tatami covered above with a huge arching ceiling floating some 20 ft above. Soon enough I would peer through the glass of the main front doors with one or two people having already arrived. In the nearly 3 years of this morning ritual I can’t say I was too pleased about that. Like I said, I am not for mornings, Londoners rarely are and definitely not this one. 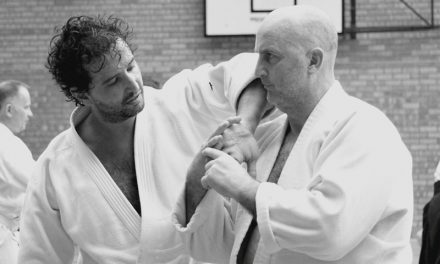 However much I tried Aikido was rarely if ever my favourite thing to do on an early morning weekday. But hey you did sign on the dotted line to do this, so get on with it, and get on with it I did. The classes were tough. This was more to do with motivation than physical hardship. The body hardly given a chance to recover from the previous days training, would need pushing to get the class going. It was often a mechanical almost automaton state of mind that would just work to get through this. One of the students who would attend these daily morning sessions would ask me after class one morning, “Is it true that O’Sensei had special powers, almost super human ones?” I answered as honestly as I could, “I don’t know about that, I don’t know about super powers. All I know is just getting up first thing and teaching you guys and doing my best to get through each day is all I can think about at this time.” This was the absolute truth of it. No romance, no myth or fantasy. He later , on my departure reiterated this story to the members during a goodbye party. He stressed his realisation that whilst he fantasised about the usual mythology of Ueshiba Sensei and the origins of Aikido, these guys, the Deshi were busting their balls to just keep going. That was the reality of life in this dojo. Inside this space it soon became evident that a bubble a world apart had been created. This was a deliberate action of Chiba Sensei’s and needed in order to achieve his ambition. He would state shortly after the dojo opening. “We now have a space, but that is all it is for now. 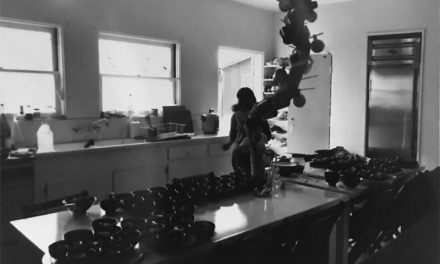 It is up to us to fill it with energy, spirit and purpose.” In other words a space is vital but it is still only 4 walls and a ceiling, it took us to make it into something. He was serious about this, something that I would have expected from him. A dojo is not your typical venue as he often reminded us. It was a remarkable place that struggled to define itself, always standing in defiance of the commercial world. After all an empty space used 5 or 6 hours a day was not exactly practical. It was in some people’s eyes useless, serving no purpose other than fulfilling the expectations and dreams of the head teacher. Yet this “useless” place was filled with an exciting energy. It was also a work of beauty, a place almost too good to train in. The green canvas, the two shrines no less, one for Shintoism and the other Buddhist. One for O’Sensei and one for Chiba Sensei, reflected their respective beliefs. These were headed proudly with a yin and yang dragon, resuming their original purpose as they once were the principle gateway to an old Buddhist temple back in Japan. The shrines were lit from behind to create an other worldly effect, an “eastern” one over seeing us in our attempts to “enlighten” ourselves. One of the early morning tasks was to fill a small cup with fresh water. This would symbolise purity, the aim of training. I never failed to maintain this ritual, which was required of me and my colleagues and one which I didn’t question but in time I showed little interest in. This came as no surprise as the ritual to me held no special purpose. Chiba Sensei expected it and rightfully I followed his wishes. This dojo he created was demanding and selfish, guarding itself from the outside world, isolated from it. 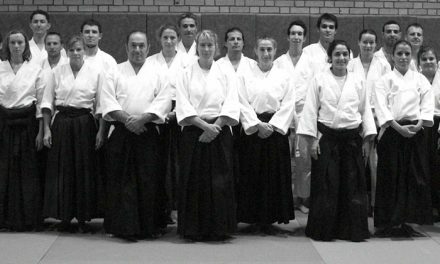 I too became a part of that guarded attitude, a difficult position to be in as “a bridge” to the members, particularly those in teacher training and to Chiba Sensei himself. He said “Your position is a difficult one, stuck between me and the students.” It was an impossible task as two worlds “outside” and “inside” would not so much collide but struggle to find any understanding and meaning with each other. This was something that was a constant in the day to day life. A “modern” martial art that claimed to connect people, to extend itself beyond the merely physical experience was at odds with the culture it tried to live with. Why this was the case is an interesting question. It was in my mind without a doubt consciously created by Chiba Sensei. He would move the goal posts, he would seldom allow a settling of the spirit. It was in fact a chaotic melee and in this environment he functioned brilliantly. I would do my best to get to grips with this, learn to live with it and even in some way to become it in time. It was tough, the demands of the art – was this possible in Southern California? The expectations of the master – were they realistic in the face of the membership? The expectations of the students – did they see this discipline for what it was or were they full of pre-conceptions? All these influenced the quality of the training and the quality of the relationships between teacher and students. Student and student. But maybe in the end it is simply that it is a challenging art to learn. Darkness would sometimes visit, a fog hanging over the dojo, surrounding it and just sitting there. It would feel ominous at times and impossible to gauge if this was a product of those who lived there with this being no more than our own personal moods and machinations. When the outside members would arrive did they pick up on this, were they oblivious or aware, we could not know. Was the bubble of dojo life designed to keep her “secrets” to a small crew? My own involvement being at the centre of all this and what often felt like an all consuming storm. I would sometimes forget that there was an outside, so immersive was the experience, consuming both my time, focus and energy. Internally I would sometimes separate things and create a sense of the inside. Us, me, Sensei and his family. And then the outside. Them, the other members, teacher training or otherwise. In reality no such thing existed, it was mainly in my head. I think ultimately it was practical if not desirable to be this way. It was believe it or not easier. It simplified things and allowed me to give 100% to this training with no distractions. 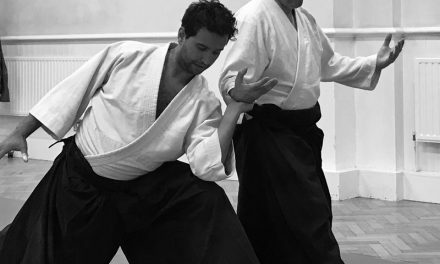 In as much as Chiba Sensei was able to create this culture of training, I got direct exposure to a more ancient and traditional knowledge that Aikido was a part of. In his own words, “I have tried to give you the same experience as I went through in Japan, I tried to create that as best I could here in America.” I always believed he was sincere in this, genuine in his desire to transmit his knowledge, as he himself had received it through his own teacher Morihei Ueshiba. He wanted to give us this experience and it depended on us willing to go for a ride with him.